A book has appeared here which will, I suppose, make a noise, by Bishop Colenso, who judging from the extracts, smashes most of the Old Testament. — Charles Darwin in a letter to the American zoologist Asa Gray of November 6, 1862. 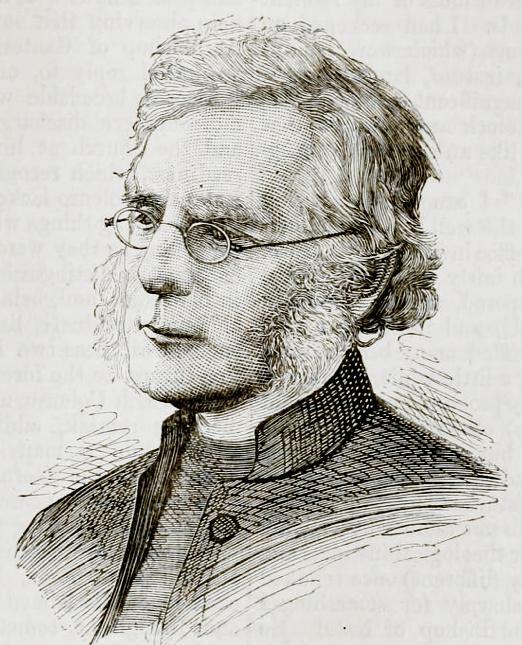 Bishop Colenso “From a photograph by Messrs. Elliott and Frye” from the 1881 Good Words. In 1862 Bishop J.W. Colenso caused a great controversy with The Pentateuch and the Book of Joshua Critically Examined when he tried to remove points of doctrine which men of the mid-nineteenth century found impossible to believe. For him the entire problem centered on the right of the minister to free thought, a right which, as he wrote in a later volume, was denied by a law which bound each minister "by law to believe in the historical truth of Noah's Flood, as recorded in the Bible, which the Chuch believed in some centuries ago, before God had given us the light of modern science." The blows of the geologist's hammer were here decisive. My own knowledge of some branches of science, of Geology in particular, had been much increased since I left England; and I now knew for certain, on geological grounds, a fact, of which I had only had misgivings before, viz., that a Universal Deluge, such as the Bible manifestly speaks of, could not possibly have taken place in the way described in the Book of Genesis, not to mention other difficulties which the story contains. I refer especially to the circumstance, well known to all geologists, . . . that volcanic hills exist of immense extent in Auvergne and Languedoc, which must have been formed ages before the Noachian Deluge, and which are covered with light and loose substances, pumice-stone &c., that must have been swept away by a Flood, but do not exhibit the slightest sign of having ever been so disturbed. the Pentateuch, as a whole, cannot personally have been written by Moses, or by anyone acquainted personally with the facts which it professes to describe, and, further, that the (so-called) Mosaic narrative, by whomsoever written, and though imparting to us, as I fully believe it does, revelations of the Divine Will and Character, cannot be regarded as historically true. The BIBLE is none other than the Voice of Him that sitteth upon the Throne! Every book of it — every chapter of it — every verse of it — every word of it — every syllable of it — (where are we to stop?) every letter of it — is the direct utterance of the Most High! The Bible is none other than the word of God — not some part of it more, some part of it less, but all alike, the utterance of Him, who sitteth upon the Throne — absolute — faultless — unerring — supreme. Colenso adds, "Such was the creed of the School in which I was educated," and such was the school in which Ruskin, Carlyle, and the Brownings were educated; and they cast off this creed, choosing to regard the Bible as poetry whose value lay in the fact that it recorded the constancy of man's need for virtue and cognizance of sin.